The following article is for GENERAL INFORMATION purposes only. Information does not SPECIFICALLY apply to all years, makes and models, but is to be used as a general reference guide. Wipe lubricant from internal parts. Rotate gears and inspect for wear or damage. Mount dial indicator to housing, and check backlash at several points around ring gear. Backlash must be within specifications at all points. If no defects are found, check gear tooth contact pattern. NOTE: Drive pattern should be well centered on ring gear teeth. Coast pattern should be centered, but may be slightly toward toe of ring gear teeth. until clear tooth contact pattern is obtained. NOTE: Backlash is adjusted by either moving shims from one side of differential case to the other or by turning adjusting nuts on which side bearing races ride. Changing of pinion shims alters the distance from face of pinion of centerline of ring gear. 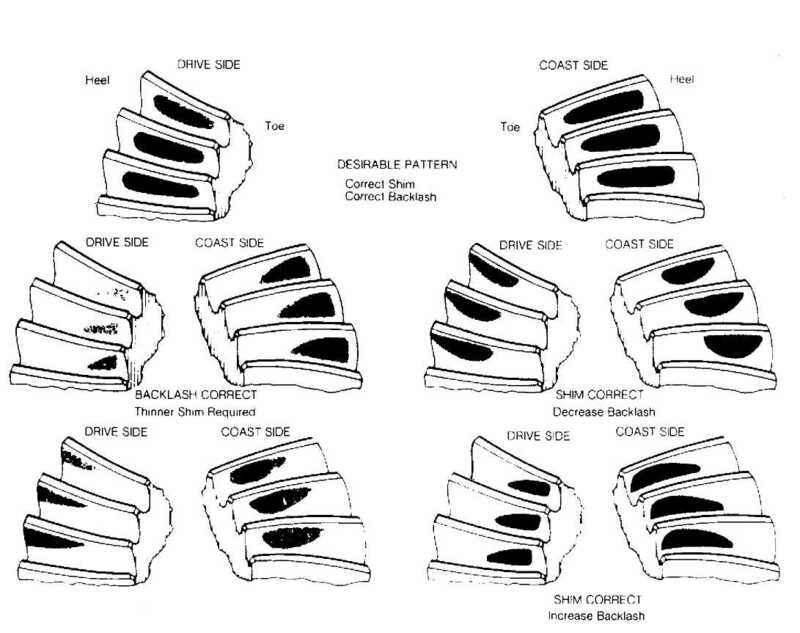 coast pattern toward toe and top of tooth. coast pattern toward heel and bottom of tooth. backlash moves ring gear closer to pinion gear. Drive pattern moves toward toe and bottom of tooth, and coast pattern moves toward toe and bottom of tooth.